Student Services is at the heart of Chatsworth. Various teachers and support staff come together to assist students in the areas of Academic Advising, Counselling, Discipline, English as an Additional Language, Guardianship, Health, Learning Support, Pastoral Care and University Advising. The Student Services Team meet regularly to discuss student issues and monitor students who need support. Student Services is also involved in writing policies to improve student welfare at the school. Some of the important areas Student Services are involved in include; individual and group counselling of students, developing a strong pastoral program, teaching communication and leadership skills, peer counselling, coping with stress, cultural adaptation, improving academic performance, and social development. Our Academic advisors help students make course selections and recommend courses based on students strengths and areas of improvement to be made. They also talk to students about their grades and take measures to motivate students to improve their results. Students are sometimes placed on academic probation or report as required. 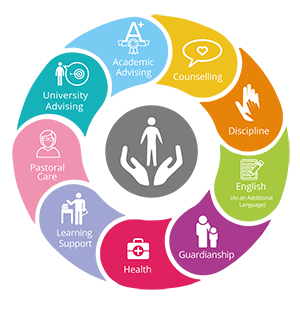 At Chatsworth we provide initial individual and group counselling for students in need. Counselling between the student and the counsellor is confidential unless the student is at risk of harming himself or herself, or another person. We also provide referrals to outside counsellors, psychologists, and psychiatrists when more extensive counselling is needed. We attempt to resolve behavioural issues quickly and gently before they become bigger issues. We use a three step model whereby most issues are resolved using intervention methods. If the problem is not resolved with intervention, or if the problem is more severe, we move to a discipline approach. If the issue continues after intervention and/or discipline methods have been used, a formal Review Board is conducted to determine what other steps might need to be taken and, if necessary, if the student is eligible to remain in the school. We encourage students to develop their English Language skills along with building a solid foundation in their mother tongue language. For students who require a more intense study of the English language, we provide support classes that run parallel to and compliment our mainstream English classes. Our objective is to provide a clear and coherent pathway for our EAL students, from Primary right through to IBDP level. This pathway is dynamic, relevant and rigorous, and highly beneficial for our entire student cohort.ween EAL Support Specialists, homeroom teachers, parents / guardians and the students. Students at Chatsworth who do not live with their parents must be formally registered with the school as guardianship students and must live with their official guardians. The school must be notified in writing by the parents before the student changes guardians. Guardians at Chatsworth are expected to maintain an appropriate level of care and support for their wards, communicate with the school and the parents of their wards regularly, and attend parent-teacher-student conferences, accompanied by a translator if necessary. We take a holistic approach to health, providing students with information to make good choices regarding sleep, diet, exercise and managing stress. Wherever possible, students are encouraged to return to class after seeing the nurse, unless symptoms indicate there is a more serious health concern. The student is permitted to go home once the parent has been contracted and gives consent. At the beginning of school year (or when the student joins the school), there will be an information form to be filled out. This will highlight the teacher whether the student has any medical condition to take into consideration. The school has the right to request for medical certificate as needed. Chatsworth provides Learning Support for students at the Primary and Secondary levels. Needs are met wherever possible within the classroom for students with assessed learning needs. Our Learning Support Coordinator liaises with teachers, parents, students, and with specialists within the community as appropriate. If needs emerge which are beyond the resources that the school can provide, a more appropriate educational setting will be recommended. A carefully designed pastoral year plan is used to facilitate age appropriate activities during weekly pastoral lessons. Each homeroom teacher has the opportunity to contribute to the topics covered, allowing homeroom teachers and their students to enjoy and participate in the pastoral lessons. Our University Advisor provides high school students with information on university options and requirements. Students are provided with information on university fairs in Singapore, and often university representatives are invited into the school. The University Advisor also provides students with transcripts and assists with the university application process. Students should consult with the University Advisor to discuss their emerging career plans and the best way to achieve these. The University Advisor will assist students with choosing appropriate institutions and with relevant paperwork. The following is a list of our Student Support Services. For any grievances or complaints, students can communicate directly with the relevant staff who will assist them.